When baby first enters the world, there is so much for the little one’s body to adjust and adapt. With skin thinner than adults and having more skin for their body compared to adults, baby’s skin is also more prone to moisture loss. For babies, the face is one of the most exposed parts and everyone loves to touch those kissable cheeks! 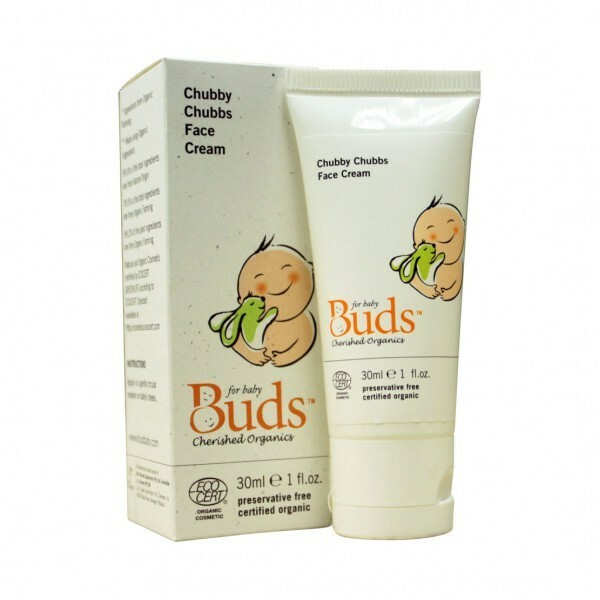 Give baby a helping hand with Chubby Chubbs Face Cream. Brought to you by Buds Organics, the experts in certified organic baby skincare, this luxurious yet ultra-mild cream is designed to protect baby's delicate face. Packed with specially selected prebiotics, natural and organic actives and plant oils, this cream hydrates deeply and nourishes the more delicate and sensitive part of the face, ensuring that baby gets the best protection. The key ingredient, ALPHA-GLUCAN OLIGOSACCHARIDE protects baby’s skin against bacteria. This natural prebiotic helps strengthen baby’s delicate skin and promote healthy skin. ALOE VERA EXTRACT hydrates baby’s delicate skin and keeps it calm, working together with SPENT GRAIN WAX as a natural anti-histamine to soothe irritable patches. ORGANIC INCA INCHI, incredibly rich in polyunsaturated fatty acids of Omega 3, 6 and 9, is critical in building the skin’s lipid barrier and promoting healthier skin. OLIVE LEAF and ROSEMARY LEAF EXTRACTS act as powerful anti-oxidants to protect the skin from harmful free radicals. ORGANIC JOJOBA OIL and SUNFLOWER OIL naturally moisturise baby's skin. Specially formulated to be super mild especially on baby’s face where it is possibly more sensitive, this cream is perfect to moisturize, soothe, protect and strengthen fragile and delicate skin. In circular motion, gently apply a healthy amount of baby’s face cream on baby’s face. Aqua/water, aloe barbadensis leaf juice*, simmondsia chinensis (jojoba) oil*, helianthus annuus (sunflower) oil*, cetearyl olivate, sorbitan olivate, hydrogenated olive oil, olea europaea (olive) fruit oil, olea europaea (olive) oil unsaponifiables, dodecyl olivate, plukenetia volubilis (inca inchi) seed oil*, spent grain wax, argania spinosa kernel oil, butyrospermum parkii (shea butter) extract, xanthan gum, inulin, alpha-glucan oligosaccharide, olea europaea (olive) leaf extract, rosmarinus officinalis leaf extract*, parfum/perfume.